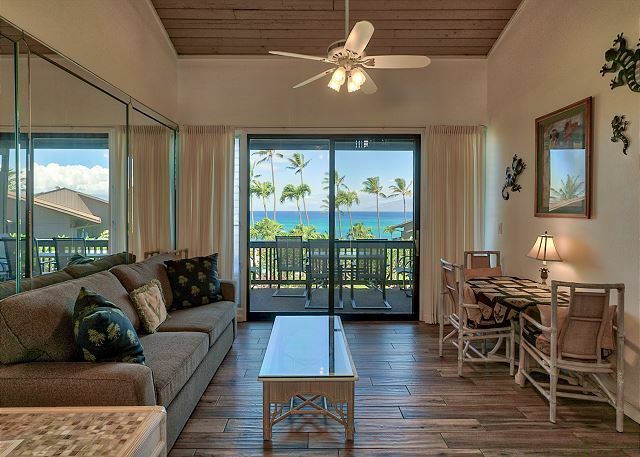 Welcome to Mahina Surf 214! 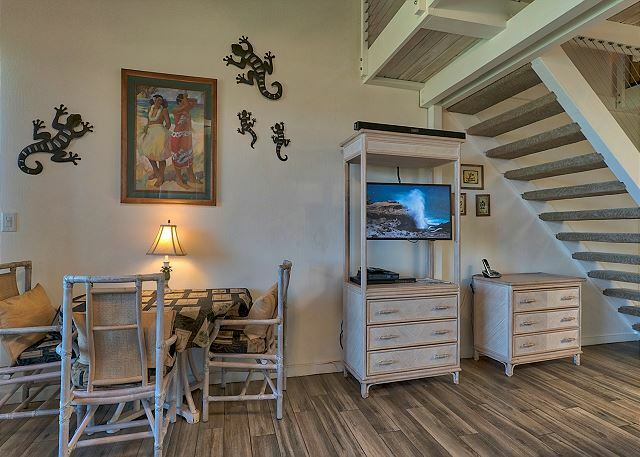 As you enter the second floor “townhome” style condo you will see the clear blue Pacific Ocean and beautiful gardens framed by the neighboring islands of Lanai and Molokai. 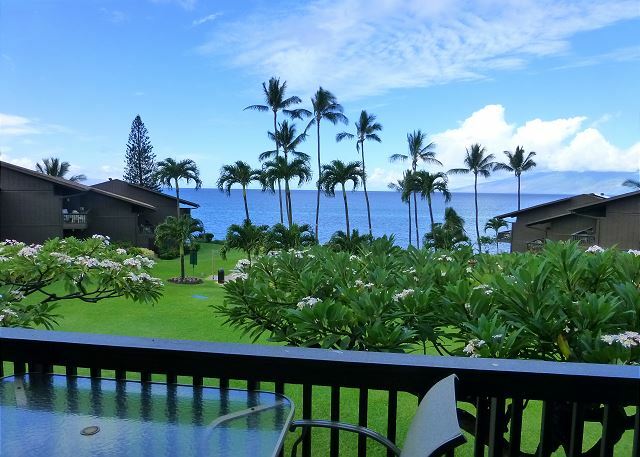 You will smell the scent of plumeria flowers from the balcony “lanai”. You will see amazing sunsets every night and beautiful rainbows “anuenue” will appear every day. You can watch humpback whales “kohala” during the winter months. A stroll through the gardens will take you to the shore where you will see the sea turtles “honu” while you listen to the waves. The condo is bright and airy with open beam ceilings; decorated in a tropical Hawaiian style with whitewashed rattan furniture and large mirrors to reflect the light and views. The downstairs private bedroom has a queen bed and lots of dresser and closet space. You will find beach chairs, umbrellas, snorkel gear, and beach towels waiting for you. 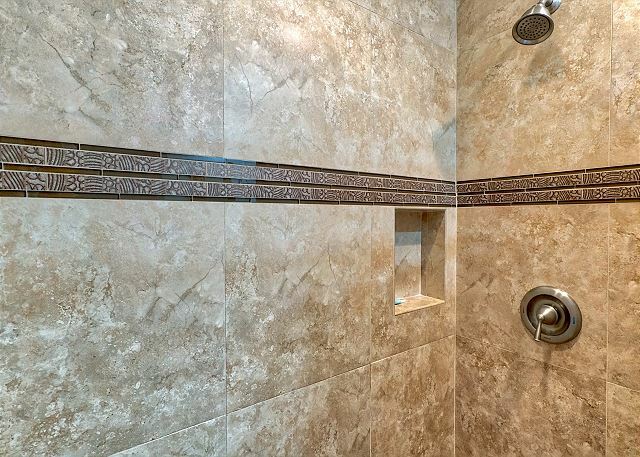 The remodeled downstairs bathroom has a large walk-in shower. There are many wonderful restaurants in Maui, but when you are ready for a home cooked meal the kitchen is fully equipped for you. We recommend the local farmers market and fish market that are nearby. The fresh island grown produce and local fish are very “ono” (delicious). 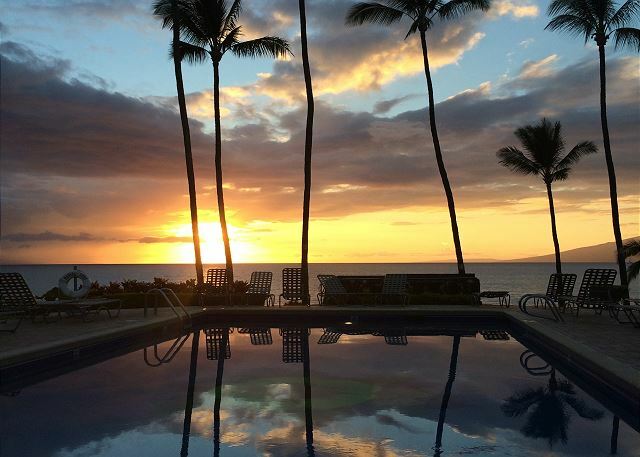 There are three gas barbeques down by the ocean; take your Mai Tai and "pupu” (appetizer) platter down and barbeque while you watch the sun setting and count the sea turtles “honu”. 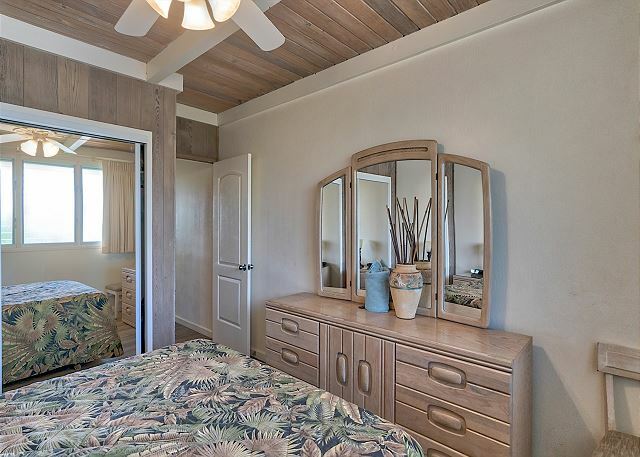 The loft bedroom is very spacious with extra windows for the trade winds to come through. The loft has an ensuite bathroom with shower and lots of dresser and closet space. There are two twin beds that can be made up into a king bed upon your request. 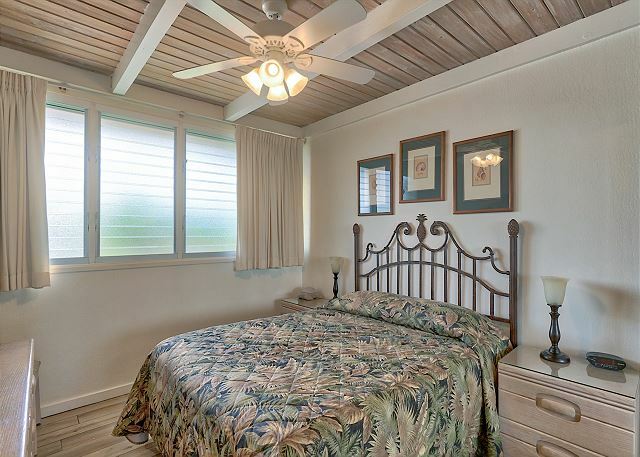 There are ceiling fans throughout the condo; all your linens are provided as well as iron and ironing board. There is a coin laundry on the property located next to the office. Very comfortable and relaxing for our family of 5. Turtles and whales viewed from the property! 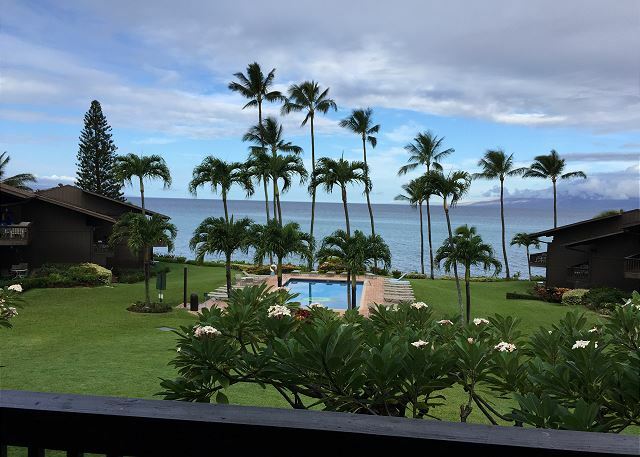 We had a great stay at Mahina surf! We rented two units, and they were both well equipped and very comfortable. 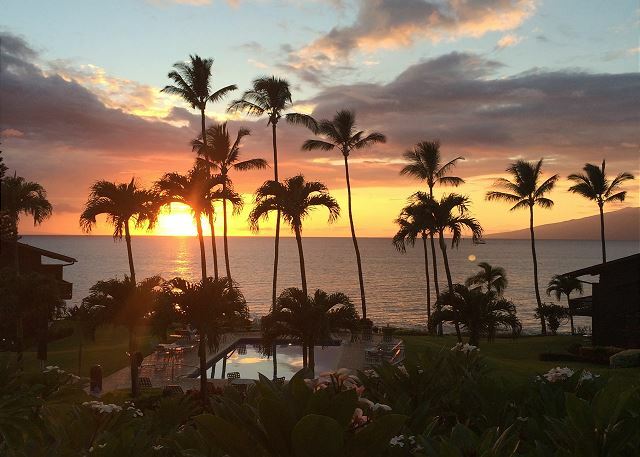 I would definitely try to stay here again on my next visit to Maui! Great staff, great location, and great view. The condo was super clean and well stocked. The view is amazing across the pool to the ocean. Sunsets from the balcony will not be forgotten. The condo is beautiful and turtles were steps away at the beach. We can’t wait to book our next trip. We were so pleasantly surprised to see how beautiful this condo and location was. It was on the water where the turtles come. The pool was cleaned every day by maintenance. The staff was very friendly. 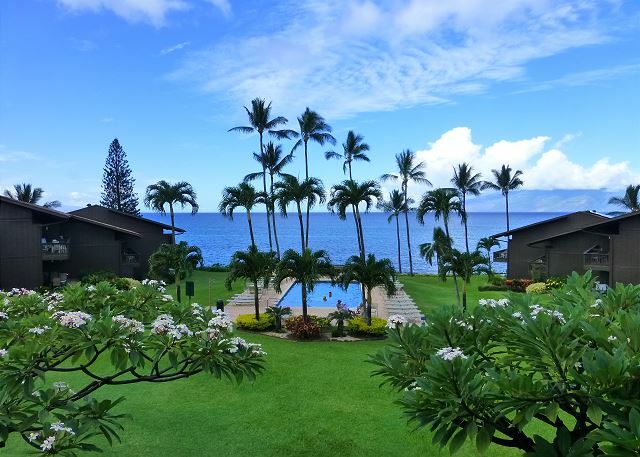 Location was perfect distance to front street Lahaina and Kanapali. Only thing we didn’t realize was no AC, but with the windows open we kept cool. The neighbor next door 216 (I believe) was very irritate about us having coffee in the morning, poked his head around and asked for us to quiet down and slammed his patio door. He also new a lot about the condo we were staying in, said the bathroom fan was loud and he knew what the owners did to upgrade the condo. He was obviously an owner. But other then that, it is a wonderful location and condo. Definitely will stay here again. Brett S from Red Deer, AB does not recommend this vacation rental. Ever feel like you miss the 80's? Renting this place will help with that problem. Nothing in this unit has been updated since then including the bed spread. Every rental dollar received on this place has gone straight to the pocket of the owner with nothing going back to the unit. You're paying for the view and access to the common pool because it was pretty gross inside. Other units we saw in this complex were much nicer. The one good thing I can say is that they gave us lots of towels, which was appreciated. The condo's were very clean and easily accessible to all services. Victor & Corinne W from Portand, OR does not recommend this vacation rental. Our first clue was mold alone bottom of shower curtain liner! Health concern! We had no instructions specific on using the TV....& we had no idea way we could not get in on the first 24 hours. The very 1st switch as you walk in by the door cuts off the power to the TV! It is not a light switch at all. The living room furniture is old & shot! We brought in 2 deck chairs to be comfortable. Office staff gone by Saturday early afternoon till Monday...we did not know what to do! Called Vince Nye - resident/owner onsite HOA. He helped with the TV issue...just one hour before the SuperBowl! If the office had been open we would have NOT accepted this unit! The carpeting is matted down & sticky. We did not take our shoes off ever. Please take this unit off the rental market. We were told they just put 2 new mattress upstairs. Well that was in 2013! Sorry to deliver this news on 214....we also stayed in 114 before & this unit was great. BEWARE....all units are not the same standard. And that is what the management should be monitoring. Please get a copy of this ASAP TO THE OWNER! Location and view (oceanfront) were perfect. Suggest an update on linens, towels, shower curtain to make the unit more appealing. Consider updating the furniture to make it more comfortable. 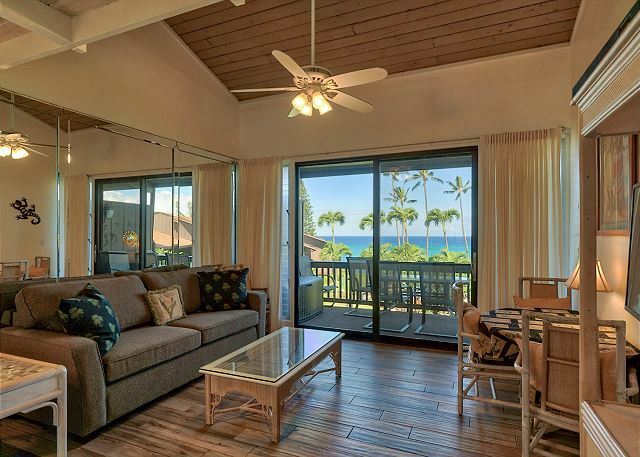 I will definitely return to unit 214 at Mahina Surf. The condo is in a great location within the complex with views of the salt water pool, ocean, and sunset. 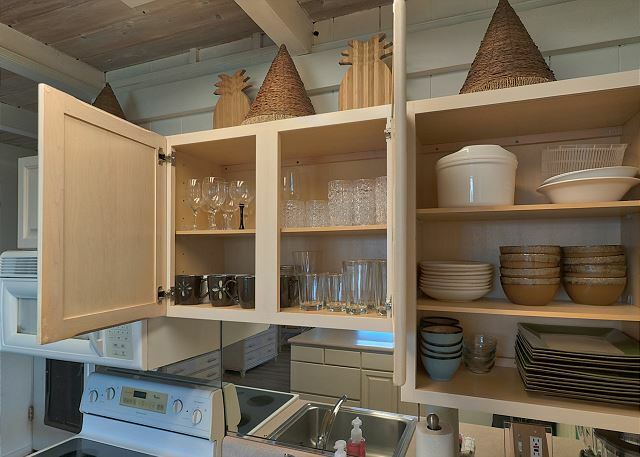 The unit was clean and kitchen well stocked with all the utensils needed to cook, bake, BBQ, and store left overs. We found snorkeling gear, Tommy Bahama beach chairs, a cooler, and swim noodles in the bedroom closet down stairs. I assumed everyone had access to beach gear inside their rental but found out from talking to other vacationers that their condo did not have any of these items. The beach gear really came in handy when the family spent some time along the shore just north of the condo. I snorkeled and came across more interesting sea life than on a chartered cruise earlier in the week. I even observed a sea turtle hanging out on the bottom of the ocean floor for quite a few minutes until he swam along. We drove to the beach but could easily have walked up. The beach chairs have back pack straps on them so you can literally put them on like a back pack. I had the snorkel, mask, fins, a book , towel, and in the cooler compartment attached to the chair carried some water, snacks, and an ice pack. I miss having a cup of coffee in the morning with an ocean view!